The following is a transcription of E R A HEADLIGHTS for July, 1945, pages 9 and 10. It lists the streetcar roster, car assignment to lines, and car and line assignment to stations (car barns). The track map below is from page 10 of the original, and shows the entire system at that time. Necessary notes by this editor, not part of the original publication, are given within [square brackets]. Copyright © 1945 and 2007, Electric Railroader’s Association, Inc. All rights reserved. Reprinted by permission. There are few cities in the country where the operation of trolley cars is so generally scenic and attractive as in New Orleans. Considerable of the lines are on private right of way, either away from the streets or in the center of a boulevard---one [sic] a neutral strip as they call it in New Orleans. 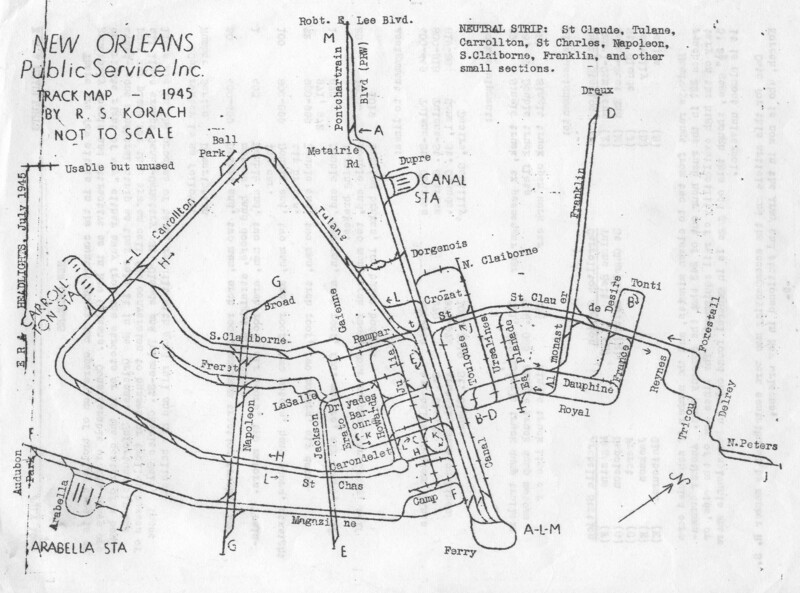 Unfortunately the post war plans for this system call for conversion to busses or trolley busses of all lines except Canal-Cemetery [sic: Cemeteries], St. Claude and Tulane-St. Charles Belt. These lines are in the process of being rebuilt with good rail and new ballast. 1 453 Double end, two man, arch [sic: deck] roof, air doors, two motors. Training car. 100 800-899 Double end, two man, arch roof, two motors, hand doors, straight air brakes. 1 970 Double end, two man, arch roof, four motors, air doors, self lapping brakes. 20 1000-1019 Double end, two man, arch roof, four motors, air doors, self lapping brakes, low built bodies. Headways range from two to eleven minutes, and the number of scheduled cars reaches 227 in the rush hour out of 243 that the company owns. Another commentary of the high availability of rail equipment. The lines are of the wide, or 5' 2½" gage, though this odd gage is in general found only in Pennsylvania where it is almost universal. Data for this article and the accompanying map were contributed by member R. S. Korach, who is now in the Army and stationed in New Orleans.